I’m back again with another fun card for Unity Stamp Company. 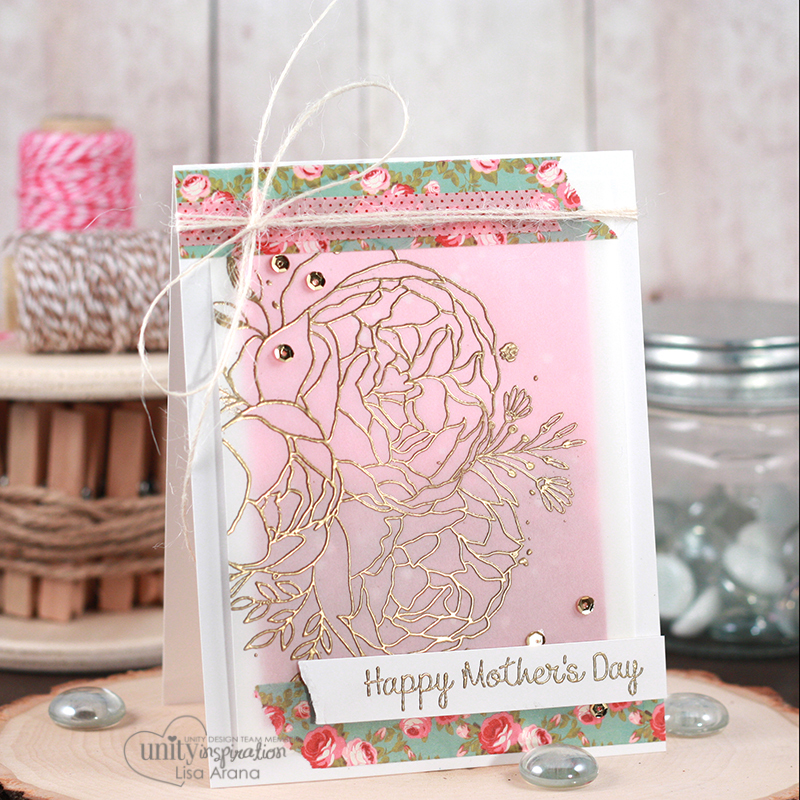 I’m baseing my card on the sketch above and sharing some inspiration for Mother’s Day using two fabulous Unity sentiment kits. I’m combining three of my favorite things for this card: gold embossing, Distress Oxide Ink blending and washi tape. What an amazing combo. I also made my little gift bag match my card by using the same stamp sets. What a great way to coordinate things. The bag was used with THIS METHOD. It’s great for oddly shaped items. 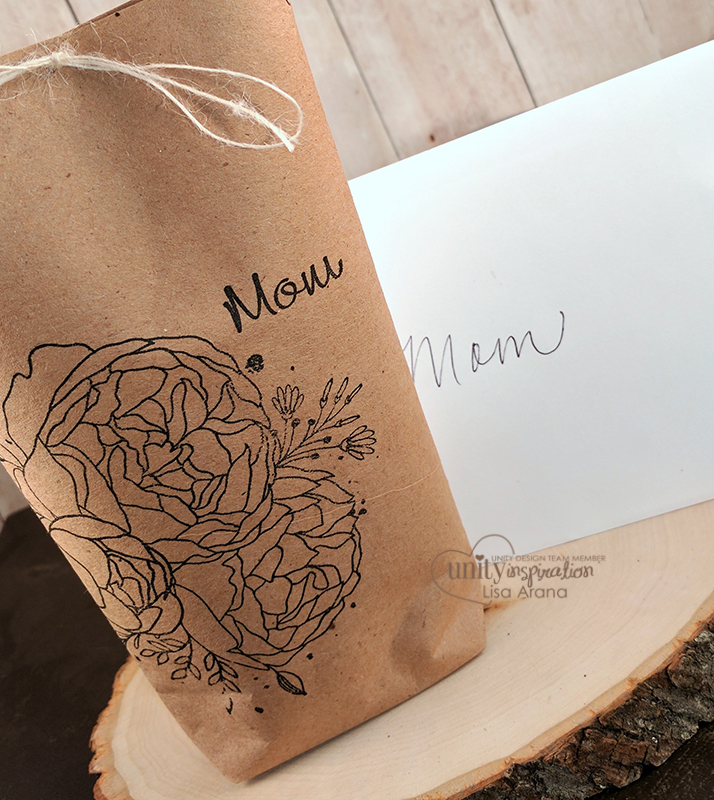 I used some kraft wrapping paper and then stamped it with my beautiful Unity stamps. I just noticed my handwriting is fairly similar to the font I used in the stamp set. Maybe that is why I love it. Start with a standard size A2 card (4.25″ x 5.5″) card using a good quality white card stock (like Neenah Solar White Crest). Mask off a rectangle on the card base with Post-It Note tape, purple tape or washi tape). Blend on some oxide ink with Worn Lipstick at the top and down to Fired Brick at the bottom. Splatter white ink over blended background (using a white spray ink or white acrylic paint watered down). Remove the tape once everything is dry. Stamp the Girl Truly flowers onto vellum paper with Versamark Ink and emboss with gold embossing powder. Trim down and glue to card front keeping in mind to hide the glue behind the washi tape. Tear some washi tape and layer over the vellum. Stamp sentiment in Versamark ink and heat emboss with gold embossing powder. Tear one edge and glue to the card front. Tie string at the top of card and glue on gold sequins with Glossy Accents. Another beyond beautiful design Lisa, love love the matching gift bag! 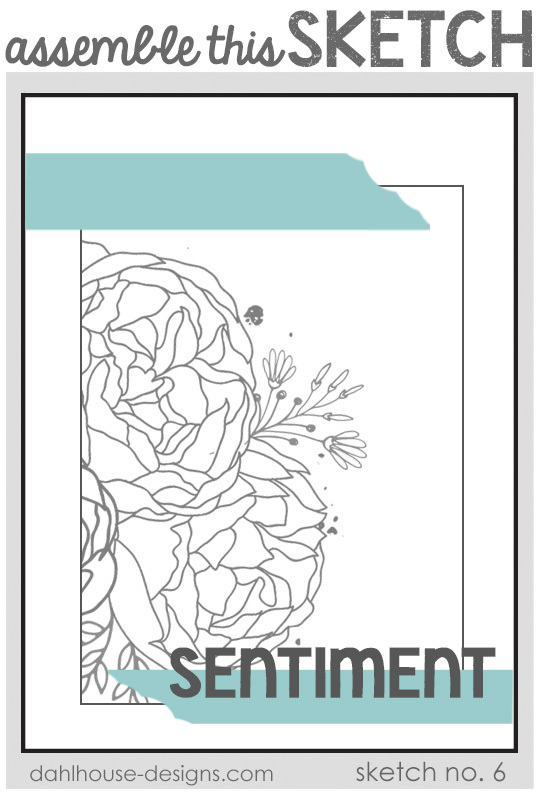 Beautiful floral image, beautiful sketch, and definitely a beautiful card! Sweet idea to make a coordinating gift bag, too.